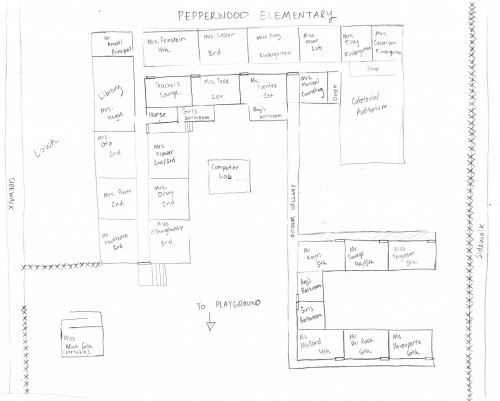 Considering the fact that I was busy plotting the Sixth-Grade Delinquents story, I don’t think you’ll be at all shocked at this map of Pepperwood Elementary, with all the teacher/room assignments, that I drew about five or six years ago. Big version is HERE if you’re interested. 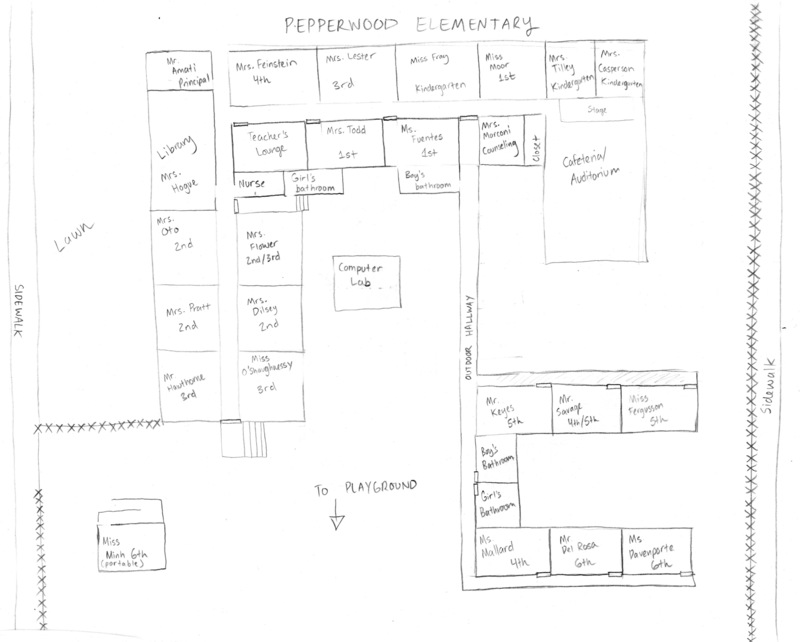 Clicking on the big version, you’ll be able to make out the names of every single teacher at Pepperwood Elementary. I’m stretching credibility a bit here, because honestly, this is too many teachers for a lot of California schools. Pepperwood has a pretty big student population, though. Over 400. So it’s not completely unreasonable. Okay, enough about teachers you don’t care about! Here’s some teachers you actually might care about if you’ve read the book. From left to right: Miss Fergusson, Mr. Savage, Mr. Keyes. The three fifth-grade teachers of Pepperwood Elementary. I like these three a lot. If you’ve read the book, you know that Mr. Savage is kind of a jerk, and that Miss Fergusson is stern but sweet, and you have no idea who Mr. Keyes is. More about him later. Mr. Savage was the only choice for Star’s teacher. Why? Because I knew they would clash, and when you’re not sure about the plot of your story, it’s sometimes a good idea to just put your main character in a terrible situation. 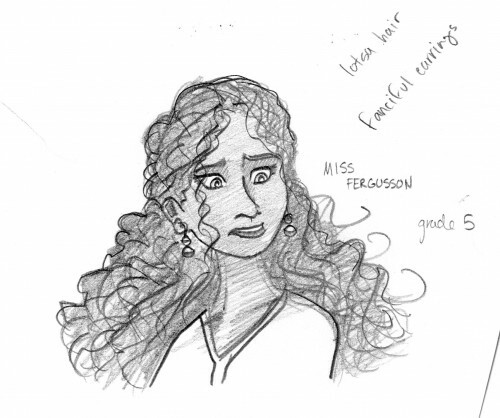 The fact of the matter was, Miss Fergusson is Star’s ideal teacher, and Star is Miss Fergusson’s ideal student, so there’s no conflict there. Mr. Keyes is laid-back, having taught kids for over thirty years, and he knows when he needs to be tough on kids, so he wouldn’t be tough on Star, since, like Eddie says, she’s not really a bad kid. 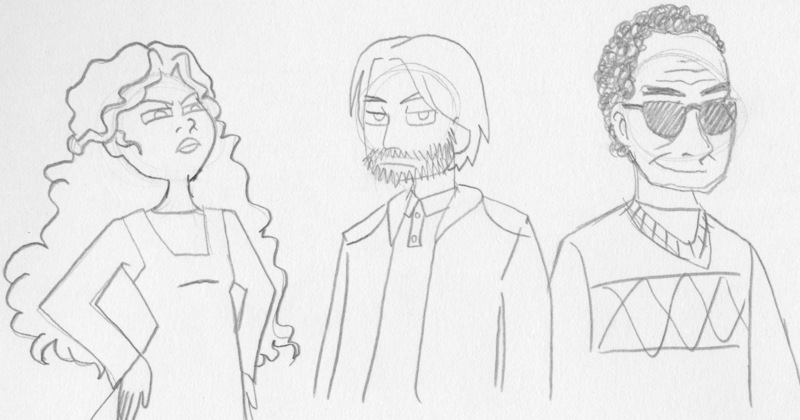 Sometimes people ask whether the characters in Hope Is a Ferris Wheel are based off anyone I know. The kids aren’t, but the teachers are. Mr. Keyes is based off a teacher I worked with in Oakland, Mr. James. (The kids called him by his first name.) Mr. James was an art teacher and an artist who encouraged his students – even the ones who weren’t good at or interested in art. He was funny and lively, and the kids loved him, because they knew he loved them, too. Even when he had to discipline them. Anyway, Mr. Keyes doesn’t appear in the book because, well, he just got cut. His character was extraneous, and Star doesn’t interact with any of his students anyway. Along with teachers, there are a couple of students mentioned in Hope Is a Ferris Wheel. 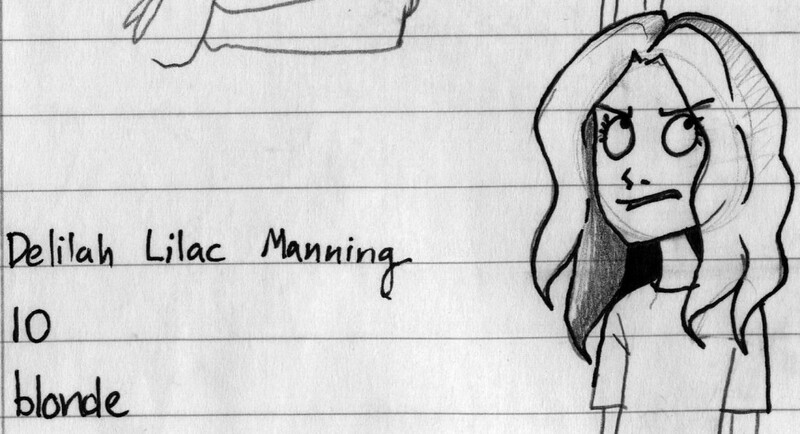 I could give lots of info-dump on Maggie, Meg, and Chelsea, but I forgot to scan their stuff in. 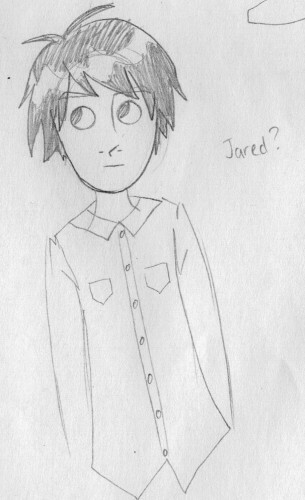 So all you get is Delilah and Jared. Delilah was originally a much more involved character. She was actually kind of the villain in the story! But a lot of Delilah’s stuff was given to Denny, and Delilah quietly slipped into the background to occasionally give biting comments and be a jerk. There was a part in the first draft where Star threw a basketball in Delilah’s face for making fun of another trailer park resident, but of course that all got cut/repurposed. But I liked that scene, because it led to Star going to the principal’s office and Winter coming down to pick her up, pretending to be Carly.